Fried rice is such a treat when we go to our local Japanese restaurant for hibachi. I love watching how they cook it on such a hot cooktop while putting on such a show. I'd love to have a cooking surface like that at home. Imagine how much fun it would be cooking dinner every night! My little one gets a kick out of trying to catch the pieces of veggies in her mouth at the restaurant, so it might get just a bit messy! When I made this fried rice at home I used a wok shaped stainless sauté pan - I'll need to invest in a good wok one of these days. 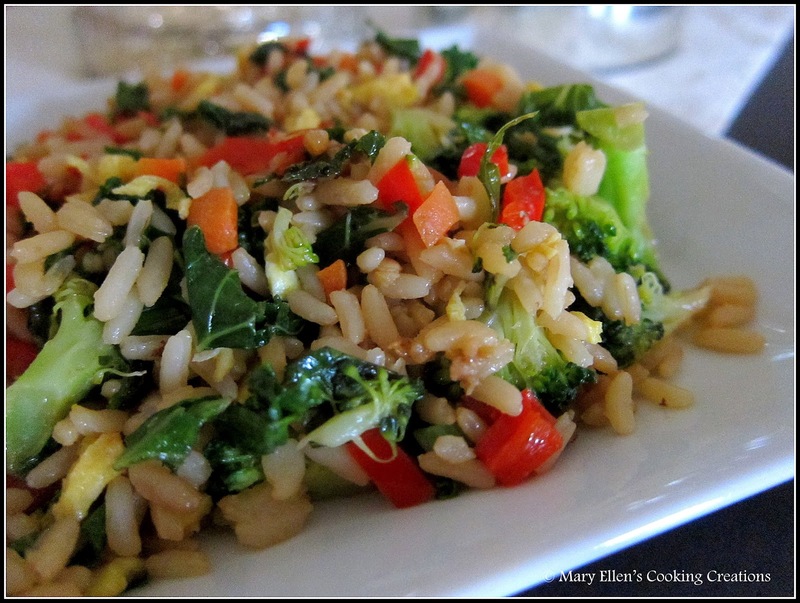 I wanted to make a fried rice packed with veggies, and turned to 2 recipes I had recently pinned for inspiration. One used edamame as the star ingredient, and the other included several other veggies, including edamame and kale. I had a ton of fresh veggies in my fridge to use up, but unfortunately didn't have shelled soybeans in my freezer like I thought I did. You can really use any veggies that you have sitting around, but next time I definitely want to add the shelled soybeans to this for some protein. I also used white rice, my husband's preference (still working on changing that one...). Add a touch of your oil and then add the egg and cook until done (I didn't scramble them, but made a large flat egg like what you would do for a folded omelet, flipped it and finished cooking it). Transfer eggs to a cutting board and chopped. Add half of the remaining oil to your pan. Add the broccoli, kale, red pepper, and carrots to the pan. Saute 2-3 minutes. Add the ginger and garlic; sauté 1 minute. Push the veggies to the side, increase the heat to high, and add the remaining oil. Add the rice and fry, tossing to coat with the oil. Make sure you scrape up any rice that gets stuck on the bottom of your pan. Add the green onions and soy sauce, and toss to mix the veggies and rice while mixing everything with the soy sauce. Finally, add the eggs and stir. Serve immediately.